I for one am so, so, SO excited to try this new product from The Body Shop. How many times have you been on the hunt for your perfect foundation? Growing up in Europe, it was especially hard for me to find the right shade as many brands at the time weren’t offering anything even close to my skin colour, let alone the tone of it. We can all be Black, but our undertones vary. I have more of a warm, reddish undertone so many foundations I try look too ashy for me. The opposite is when I find a foundation that on the surface looks great but then I see under particular lighting looks too orange on me. It’s a big reason why I haven’t really been much of a foundation girl. 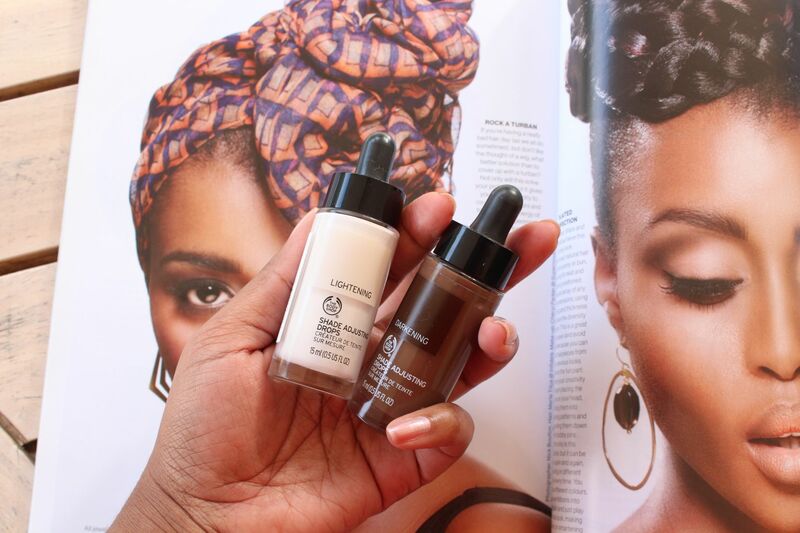 So earlier this year, when The Body Shop informed me that they’re releasing a new product that allows you to adjust the shade of your foundation to suit your skin, I was immediately intrigued. The Body Shop’s Shade Adjusting Drops are so clever, I have no idea why they weren’t thought of before. They’re a pair of concentrated liquid foundation bottles that each come with a dropper. You can use them to adjust another Body Shop foundation or if you’ve got an old faithful, you can mix them with that too. They’re compatible with most liquid foundations. Our skin goes through many changes in life and we’re not always the exact same colour. For me and many other women, the seasons affect me; I’m usually lighter in winter. And for some crazy reason, I usually get even lighter when I’m home in Tanzania (no idea how that happens though since the sun there is so gangster). But when I went on my honeymoon, my skin turned about 5 shades darker than my normal – and stayed that way for a good few weeks! So, most of my face products were totally unusable at that time and I had to forgo them. But buying a whole new set of makeup (concealer, blush, BB cream etc.) made no sense to me or my wallet so I just waited it out until my face got back to normal. It happens. For lighter skin: If you’ve bought foundation that’s a bit too dark, you can use the off-white lightening concentration to lighten up your shade. The rule of thumb is 1 drop gives you a 1/2 lighter shade. Play around with it to get your perfect colour. For darker skin: If you find your foundation is too light but the next shade is a tad too dark, use the darkening drops to adjust the shade. The concentration is a mix of black and red pigments to keep the natural depth of darker foundations. The same rule of thumb applies; 1 drop gives you 1/2 darker shade. My favourite part about these drops is they haven’t left us brown girls out. The darkening bottle isn’t a medium-ish colour – it’s dark enough to create enough shades to give us a variety. You can also use them to contour your face just by creating darker and lighter versions of the same foundation. I’ll be experimenting with these drops over the next few weeks and will report back to you on how I’m doing. With winter around the corner, I’m excited to have these on hand. You can get The Body Shop Shade Adjusting Drops from The Body Shop stores nationwide for R300. I peeped these at the Shop the other day. Genius. especially for make-up artists. I wonder if the adjusting drops would work on other foundation brands. MY WORRIES WOULD BE OVER!